Croc Encounters was established in January of 2005 as a non-profit sanctuary dedicated to rescuing unwanted reptiles. While crocodilians have always been our main focus we have extended our haven to unwanted reptiles, birds, and mammals. In addition to being a sanctuary we are an educational facility open to the public for guided tours, self- guided tours, and events. In the summer of 2008 Croc Encounters opened its gates for guided tours after three years of hard work and dedication. Tours were offered to members, schools and other groups on a scheduled basis. After several years of offering strictly guided tours the demand for self-guided, walk-through admission grew stronger and Croc Encounters closed the grounds to the public for renovations. We began reconstructing parts of the facility to allow the public to safely tour the grounds on their own. The facility is being renovated gradually in managed phases. As each part is complete it will be opened to the public. In April of 2013 Croc Encounters re-opened the grounds for self-guided tours on Saturdays. "Sneak Peek Saturdays" offers a special up close and personal look at areas of the park. Croc Encounters still continues to offer personal guided tours, tours for schools and groups as well as special events every day of the week. Exciting experiences also extend beyond the facility grounds. Our education teams consisting of experienced volunteers and handlers reach the community at events such as birthday parties, summer camps, school programs, library programs and more! Croc Encounters has offered educational programs, traveling exhibits and displays throughout the Greater Tampa Bay region as well as Nationwide since 2005. Croc Encounters is a family operated facility. 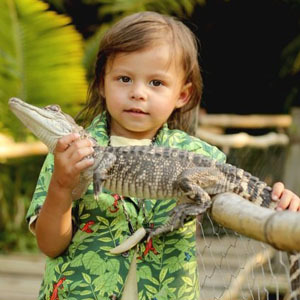 John Paner, known as "Jungle John" at Croc Encounters, is originally from Buffalo, New York. His inventive, motivated, and energetic personality has helped make the facility what is is today. 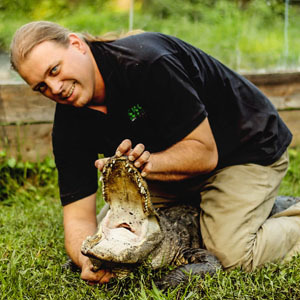 He's been working with crocodilians and reptiles in general for most of his life and has had a passion and love for wildlife since childhood. Karina Sura Paner, "Krocodile Karina" is originally from South Florida. Her enthusiasm and passion for wildlife conservation continues to drive the facility's conservation and educational efforts. 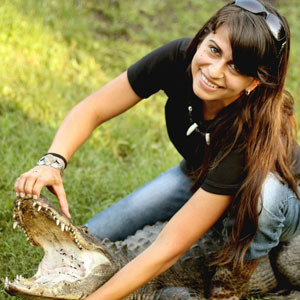 She has been working with reptiles for close to ten years. 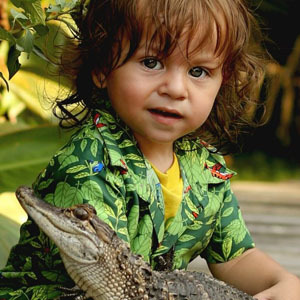 John Amos, the first born son was named after Amos Moses, the most favored alligator at Croc Encounters. With his immense energy and curiosity "Jungle Johnny" loves nothing more than helping out at the sanctuary. Whether its feeding the tortoises, filling ponds or holding an alligator his enthusiasm is overwhelming. Jake Kai is the second born and is a spitting image of his father. Just like his daddy, "Jungle Jake" loves spending time exploring outdoors and getting dirty. He loves the alligators so much that he includes Spike and Amos in his daily conversations. We are all volunteers and together we are the "Croc Encounters Family". Many volunteers have come and gone and some have stayed with us through the years. We are very grateful for past and present volunteers as Croc Encounters would not be the same without their help.